Visit Nakhon Pathom! – It's a Britta Bottle! When not stuck in Bangkok traffic, it takes about an hour to get from the heart of Bangkok to Nakhon Pathom city. A visit to Nakhon Pathom could make an easy day trip, but for those interested in traveling more extensively around the province, there are hotels located in Nakhon Pathom city as well as accomodations at Sampran Riverside. That said, you probably don’t need more than two days here. Wat Phra Pathom Chedi–Located in the center of Nakhon Pathom city, this is the highest stupa in the world and the people of Nakhon Pathom are exceptionally proud of it. While the present-day stupa was completed in the late nineteenth century, some historians believe the area around the site was occupied by a Buddhist temple as early as 325 BCE. 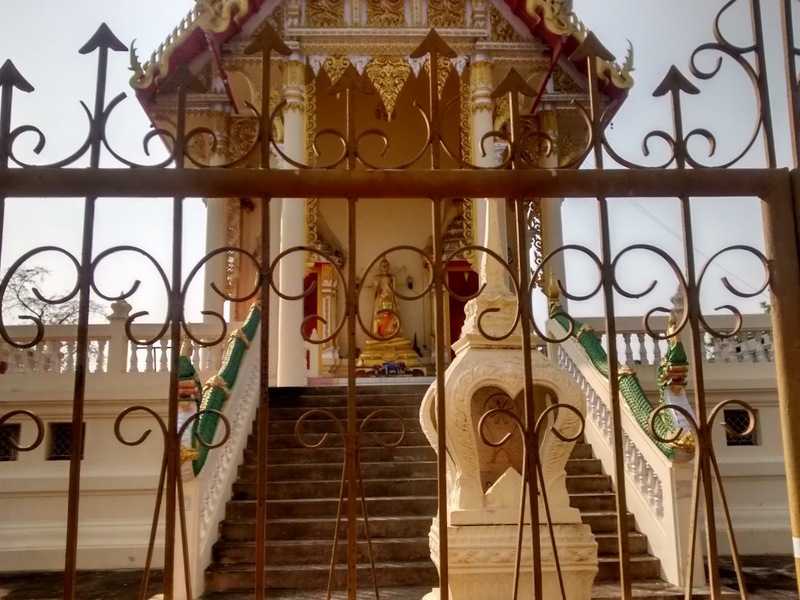 Nakhon Pathom is believed to be one of the earliest homes of Buddhism because of archaeological evidence around the Phra Pathom Chedi–and many Buddhists make pilgrimages here because of that. Phuttamothon–In the nature of Nakhon Pathom being an important area for Buddhism, it is also home to the highest free standing Buddha in the world, at Phuttamonthon Park. Phuttamonthon Park is located near the town of Salaya, right on the border of Bangkok Proper. I only wish I would have discovered this place earlier, as I may have spent many a weekend afternoon here munching on papaya salad and reading a good book, instead of the one Sunday that I did. While a holy place–a part from the Buddha statue situated at its center, this park is home to numerous temples and other Buddhist structures–it is also very much a place of leisure. It is not uncommon to see bikers and runners here, along with those people coming to give homage to Buddha. My advice–rent a bike and explore the park this way. It’s rather expansive and there’s so much to see. A tree in the park. Given the Buddhist nature of the park, I’m sure it has some significance–though I’m not sure what. The spot where I had my lunch and read. There were quite a few of these awnings–offering protection from the hot Thailand sun–and many people were relaxing under them the day I was there. Nakhon Chaisi Historic Downtown and Weekend Market–Nakhon Chaisi is close to my heart because this is the town I lived in. The real charm in Nakhon Chaisi is its historic downtown area, right on the Chin River. Nakhon Chaisi is a common place for Bangkok residents to come on the weekend–it’s quaint and adorable, with it’s nineteenth century store fronts and antique ships; a nice escape from bustling Bangkok. My favorite coffee shop in Nakhon Chaisi was located in this historic downtown area–the elderly Thai man who owned the place could often be found playing chess with his buddies and whenever I ordered coffee, he would bring me hot tea for free–perhaps because he was so intrigued to have a foreigner in his shop. The weekend market is next to the historic shops and though it is small compared to other markets in Thailand, it is delightful to stop by. Visiting the downtown area on the weekend with the shops open and the market in full swing is like stepping back in time to nineteenth century Siam–it’s hard not to fall in love with its charm; those who appreciate history will especially be grateful for the visit. I recommend picking up some pomelos while here. Nakhon Pathom is famous for its pomelo production and you can find them being sold at multiple shops and at the market. Sampran Riverside–I actually haven’t been here but I’ve heard good things about it. Home to a rose garden and Thai style houses, among other things, it sounds like the perfect way to spend part a afternoon. There’s also a hotel on the grounds for those wishing to stay over. Nakhon Pathom is a college town and therefore home to quite a few bars. If you’re staying over in Nakhon Pathom city and are interested in checking out the local night life, I hear Nakhon Pathom has some fun places. Nowhere near the likes of Bangkok, of course, but not too shabby for a smaller city. Again, I haven’t been (though kind of wish I would have), but that’s what I heard from fellow foreign teachers. Nakhon Pathom is home to an abundance of wats. If you’re feel so inclined, I recommend researching some of the temples in Nakhon Pathom, renting a motorbike, and going on a temple tour. Seriously. I’ve only been to a handful of the wats in Nakhon Pathom and given that Nakhon Pathom is an extremely important place for Buddhist history, there are tons and I mean tons of wats in the province. One particular wat worth mentioning here is Wat Bang Phra, a famous wat known for its monk tattoos in Nakhon Chaisi District. While the sanitation and safety of receiving such a tattoo is a little sketchy (the same needle is used for each tattoo given), it is a really neat aspect of Buddhist culture worth mentioning. Anyone can receive such a tattoo, regardless of if they’re Buddhist or not; in fact, one of the foreign teacher’s teacher at my school has a tattoo from Wat Bang Phra. The bottom line: Nakhon Pathom Province is such a culturally rich and fascinating area; while I’m glad it’s not over congested by tourism, I do think more people should consider a visit here. It really is the perfect place for people interested in getting off the main tourist path, especially since it’s so close to Bangkok. That said, I really don’t think the province has a chance of becoming a major tourist location any time soon because of how fiercely loyal the locals are to the culture and livelihood of the area (they rejected a proposal for the Chedi Wat to become a UNESCO World Heritage site a few years ago for these reasons). Perhaps being so close to Bangkok and Ayutthaya, they are also aware of how tourism can affect an area and wish to avoid that. At any rate, a visit to Nakhon Pathom will be a remarkable cultural and historical experience. It doesn’t offer the amazing national park views of Kanchanburi or the remarkable ruins accessible at Ayutthaya, but Nakhon Pathom has a charm all its own; if you’re planning a trip to Thailand, I recommend thinking about including it on your itinerary. “The Temple with the Dogs,” Nakhon Chaisi District–I actually have no idea what this wat is called, but some of the other foreign teachers called it “the temple with the dogs,” because there are some dogs that hang around here. 1) Hail a Cab–this is undoubtedly the easiest route, but also more expensive. Bangkok taxis do drive to Nakhon Pathom, but you may have trouble getting them to turn on their meter because of the distance (BKK taxi drivers are required by law to use their meters, but often don’t, especially when dealing with foreigners who they think they can scam). If you absolutely must take a taxi, it is an option but I wouldn’t recommend it as a first choice. 2) Take the train–I’ve never done this, but the 9:20 am train from Hua Lamphong station to Hua Hin stops at Nakhon Pathom. Read more about this here. 3) Take a bus–Buses leave from Bangkok’s Southern Bus Terminal to Nakhon Pathom. The downside to this option is that the southern bus terminal is really far out from the center of Bangkok. You can either take a taxi or a city bus to get here. By the time you do arrive at the station, you’re already practically halfway to Nakhon Pathom. 4) Take a Van–To take a van, you must BTS to Victory Monument. Victory Monument is rather huge and can be slightly confusing if it’s your first time there, but there is a small building on one of the corners where you can go in and buy van tickets for numerous destinations. Find this building. Go inside to the booth that says “Nakhon Pathom” on it and ask for a ticket to Nakhon Pathom. Tickets to Nakhon Chaisi cost 60 baht ($1.86 USD). I’ve never ridden to Nakhon Pathom city from Bangkok because it is about fifteen minutes past Nakhon Chaisi where I lived, but expect a ticket to Nakhon Pathom city to be slightly more expensive than to Nakhon Chaisi. Once you have your ticket, wait at the door by all the other customers and when they call your van, get in! (this may seem rather hurried and confusing, but just keep your ears open). You’ll be cramped in with about twelve other people so it’s not the most comfortable, but it’s relatively cheap and for about and hour ride, it’s not a bad option at all. It’s also a super common way of travel for Thai people, so you’ll be riding as the locals ride! Once in Nakhon Pathom, taxis, motortaxis, and tuktuks are available for transportation. If you want more freedom to move around at your leisure, I’m sure you can find a place in Nakhon Pathom city to rent a motorbike for your stay. EDIT: I just read an article in the Bangkok Post about the military’s efforts to relocate van services from Victory Monument. I have no idea if the military will be successful with this relocation, but given van popularity with passengers, I presume van services will still continue somewhere, regardless of if they are stationed at Victory or not. I will be staying in Nakhon Pathom for 3.5 weeks nearby in the city centre in August 2017 -can you recommend anywhere I could rent a motorbike from whilst I’m there? I’ve never rented a motorbike in Nakhon Pathom–teachers from the school I taught at helped me buy one. If you can’t find a rental place in Nakhon Pathom proper, you could always rent one in Bangkok and drive it out to NP. Best of luck on your travels! Nakhon Pathom is such a fantastic place, and I hope you enjoy your time there.